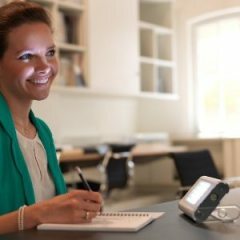 Is The Lumie Vitamin L Slim Lightbox for Effective SAD Light Therapy Too Minimal To Be Effective? All SAD sufferers want a device that is simple and effective above anything else, and the Lumie Vitamin L SAD Lightbox could be a the answer. Lumie weren’t kidding when they called this their “slim” light box. There is a thin, tablet-like shape with a stand and a broad light source. 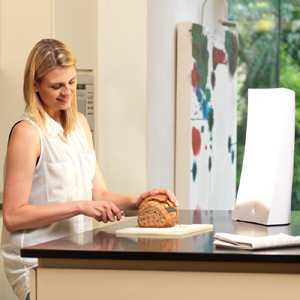 Many buyers will have high expectations from Lumie as a maker of light therapy solution. This is because they have a lot of experience in this field, and plenty of loyal customers. Is this a good example of their work, or is it too simplistic for most needs? Lumie Zest Combination Light Therapy – Portable SAD Lamp and Wake-up Light is a multi-purpose light therapy and dawn simulator machine that fits the bill, if you’ve been having trouble falling asleep then this is the right product for you. It is white in colour with a timer on the side that adjusts automatically into 5 unique light settings, giving users the freedom to optimize their lighting needs. Doctors also recommend it for treating certain medical conditions such as winter depressions and SAD or Seasonal Affective Disorder. Does The Odd Shape Of The Lumie Brazil SAD Light Box Make It A Beneficial Buy? When you are searching for a light therapy device, it is hard not to notice the large, bold Lumie Brazil SAD Light Box. As with many lights of this kind, the concept is pretty simple; three powerful spectrum bulbs project light at up to 10,000 lux for a recommended thirty minutes a day to help combat SAD and other related conditions. Lumie is a company that is regarded as Europe’s leading light therapy specialist, meaning there are sure to be high expectations of this product, but does this status come across in the function and results of this light therapy box? Can The Lumie SAD Light Desk Lamp Help Or Is It Just An Overpriced, Glorified Desk Lamp? The Lumie SAD Light Therapy Desk Lamp seems like a pretty straightforward and attractive treatment option because of its high contrast light (with up to 10,000 lux) Class 2a medical certification and different treatment options thanks to the removable diffuser. 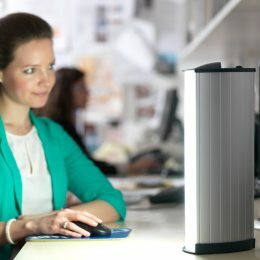 Essentially, this Lumie product looks like a basic desk lamp with a special, SAD-combatting light source and little else, which means that although it is appealing and simplistic, there are also concerns that it is nothing more than an expensive placebo. Has this product been effective and what benefits does it actually offer? The Lumie Zip SAD light box is a portable LED lightbox that you can use to treat SAD or Seasonal Affective Disorder. It provides extra brightness that can help eliminate the SAD symptoms such as jet lag, sleep disorders, depression, low mood, poor concentration, low energy levels and the like. 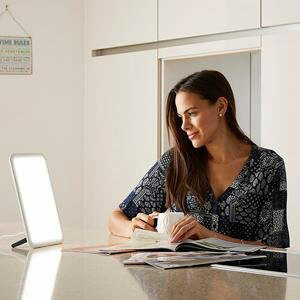 The Lumie Arabica SAD Lightbox is one of the most useful devices of modern age as far as the light therapy is concerned. It is a product which can serve you multi-purpose. The first and the foremost is the treatment of depression and bad mood though effective use of SAD light. The people who are fond of working on computers till late nights can use the device for lifting their senses and refreshing their mind after working for hours together. 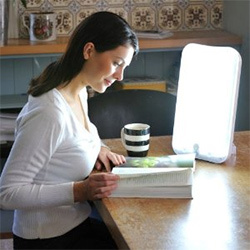 The SAD (Seasonal Affective Disorder) syndrome which is characterized by depression and mood swings, can be best treated with the help of the bright light of the light box. Lumie Brightspark LightBox emits extra bright light for treating Seasonal Affective Disorder (SAD) and sleep disorders. 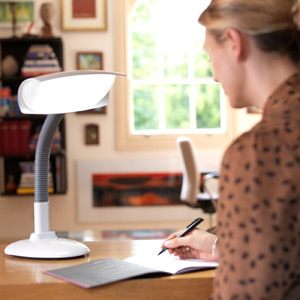 The SAD lamp also boosts concentration and energy levels for those who suffer from sunlight deficiency. Its slim design and small footprint makes this sleek Lumie Brightspark lightbox great to use just about anywhere. SAD Light therapy has been proven to be natural and healthy treatment for those who lack sunlight exposure especially in the winter. Clinical studies show that individuals can be energized when illuminated with bright light by resetting the internal body clock.